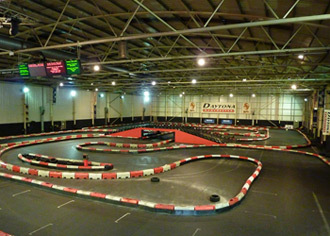 This is one of the few tarmac-surfaced indoor venues around and offers lots of grip for the karts.The track also has one of the best viewing facilities as the whole circuit can be seen from the mezzanine floor, which is also where the cafe and bar are located. Conference and meeting rooms are available for hire with all the extras you could wish for. Popular events are listed below but for larger group events (20+ drivers) please call for details. Head east on Lloyd Street toward Southmill Street then turn right onto Southmill Street and then take the second right onto Bootle Street. Turn left onto Deansgate/A56 and continue to follow A56 taking the slight left toward Chester Road/A56. Turn left onto Chester Road/A56, continue to follow A56 keeping left onto White City Way then slight right on to White City Way/A5063 and continue to follow A5063. Turn left onto A5081 - Destination will be on the left.